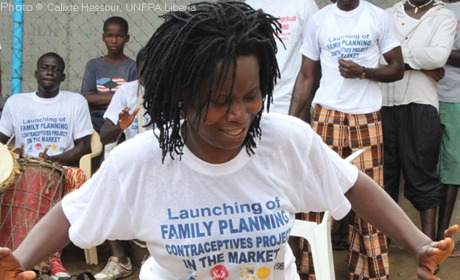 Active in Liberia since 1979, UNFPA helps to deliver better emergency obstetric and newborn care, prevent and treat obstetric fistula, manage reliable supplies of modern contraceptives, and stop gender-based violence. Recovering from 14 years of conflict that ended in 2003, many people in Liberia still live in poverty. Young people face formidable challenges, and early marriage and pregnancy are common among girls. UNFPA’s focus on youth includes supporting targeted sexual and reproductive health care services, and comprehensive sexuality education. It also backs data collection and analysis to inform policies on youth, gender equality, and sexual and reproductive health. The results featured here are only a selection of key results in line with strategic plan 2014-17 indicators. The selection does not reflect the full picture of all results achieved during the strategic plan cycle by UNFPA programme countries.